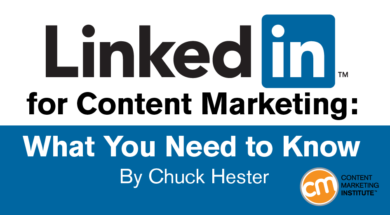 If you are a LinkedIn member – and there are more than 500 million – you can be a content marketer on the platform. 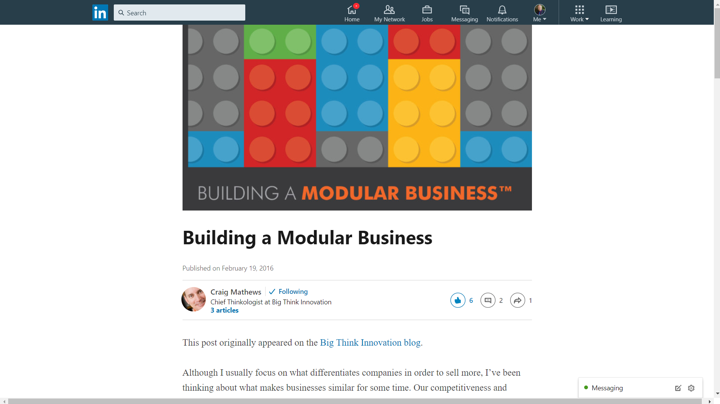 About two years ago, LinkedIn opened its publishing platform to all members, allowing them to publish blogs directly and promote their content throughout the LinkedIn network and beyond. While LinkedIn is primarily a B2B social media platform, both B2B and B2C brands can benefit from publishing on it. Executives from Virgin (including Richard Branson), GE, and Microsoft all publish on LinkedIn. Publishing directly on LinkedIn increases their reach and allows them to connect directly with their customers. There are two main ways to publish on LinkedIn. The first is LinkedIn Publisher, in which a LinkedIn member can write a long-form article – usually five to seven paragraphs – and share it with their LinkedIn network. The second is a LinkedIn status update – a Twitter-like feature that is perfect for short, concise updates and messages. As LinkedIn’s publishing opportunities have evolved, there are three things you need to know. I’ve been posting through LinkedIn Publisher since 2014 and still like its use in content marketing. But over the last year, engagement has decreased. As you’ll see below with specific examples from my LinkedIn published posts and status updates, the change is significant. From personal experience, and observation of other metrics from clients and colleagues, it is clear that short-form status updates are proving to get more comments and shares than LinkedIn long-form articles. Look at the analytics for one of my recent LinkedIn articles, a long-form post of approximately 350 words. I used LinkedIn Publisher to create the post. I received 170 views, four comments, and 21 “likes.” That’s average for number of views for my long-form posts on LinkedIn Publisher. 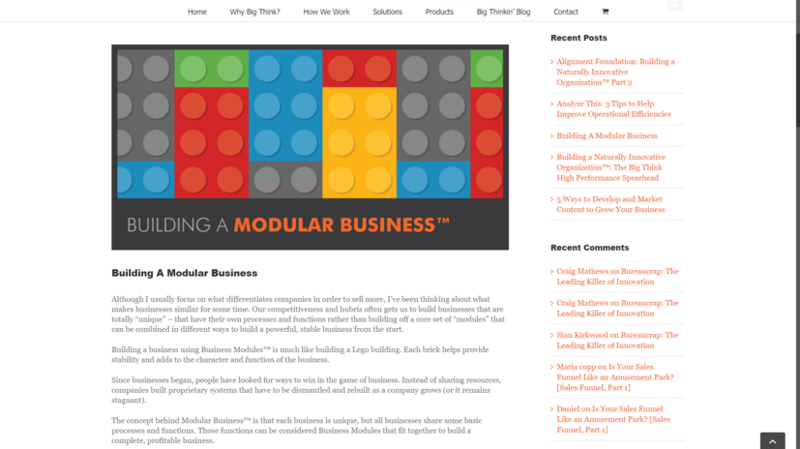 That said, a content marketing plan incorporating both LinkedIn blog posts and status updates is a solid strategy. Use status updates for quick, easy-to-read messages. Elaborate in long-form LinkedIn Publisher posts about twice a month. TIP: Use status updates to promote your long-form posts by sharing excerpts. 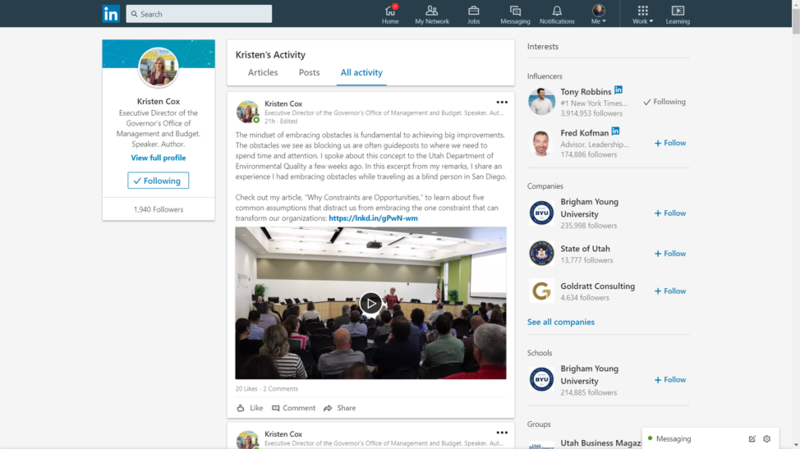 LinkedIn now gives you the ability to post video status updates directly on the platform. 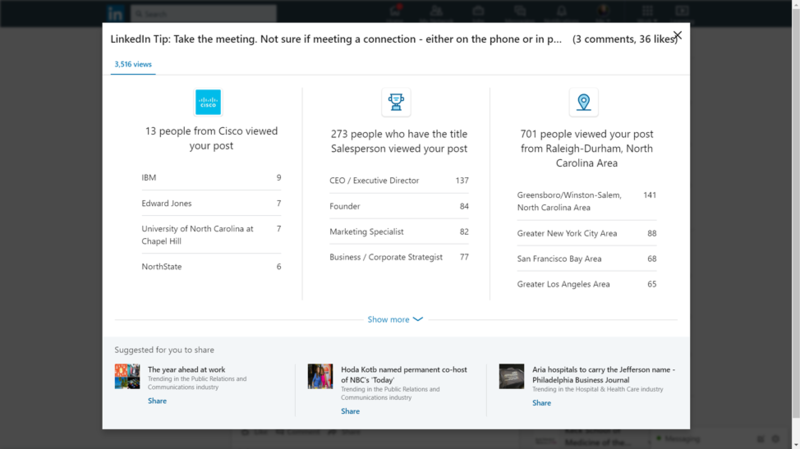 Plus, you can add video to company page updates and your LinkedIn profile. It’s a dynamic way to engage your audience and get more views of your content. Client Kristen Cox has mastered the use of LinkedIn video and content marketing on the platform in general. She is the state budget director for Utah and a consultant. She publishes a 60-second video status update on a topic and refers to a LinkedIn post she has written on the topic. (She writes about efficiency in government and innovation.) It gives her audience relevant information while driving traffic to the article and deepening engagement. Do you already blog somewhere else? Share it through LinkedIn Publisher. This can be done in a few easy steps. 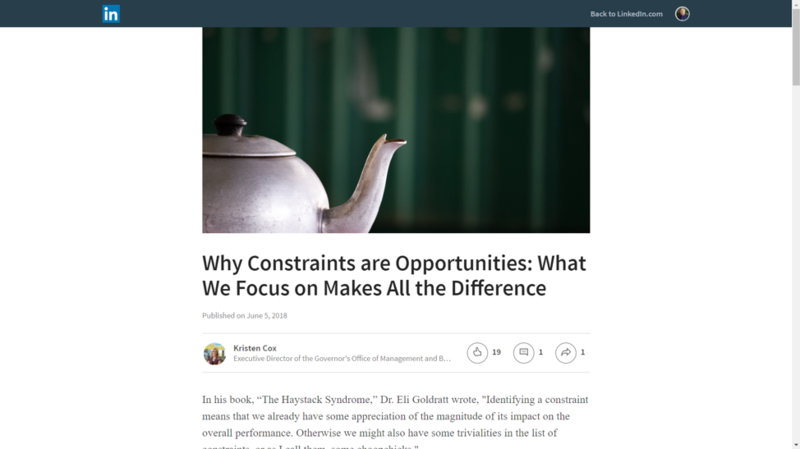 Cut and paste your headline, image, and body copy into the LinkedIn Publishing page. But here’s the kicker, add a simple phrase – “as originally seen on the ABC blog” and include a link to it. You not only have a new LinkedIn post, you’re driving traffic to your website. 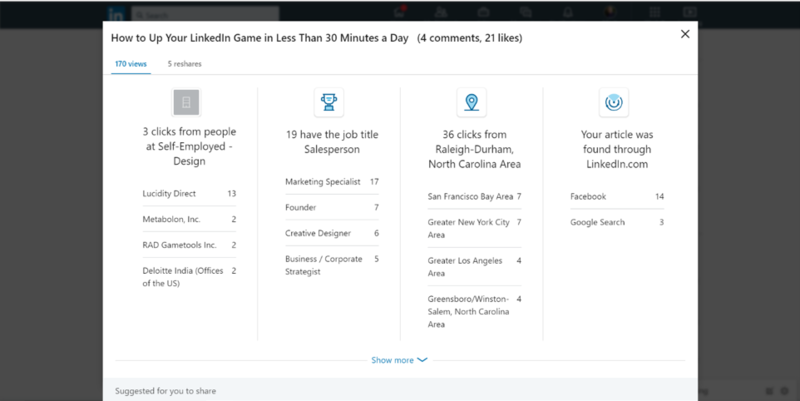 You can use this tactic in multiple ways on the LinkedIn platform. For instance, if you write an article on the top five things you need to know about your industry, post a series of five status updates – each with one of the points – and always link to the original article. There are many ways to use LinkedIn for content marketing, but, as with any channel, the content needs to be relevant to your audience. Take time to understand the features of LinkedIn and how it can be used for content marketing. It will pay off in the end. Post a few LinkedIn status updates or long-form content on LinkedIn Publisher from the lessons you learn at Content Marketing World, where Chuck is moderating the keynote track. Register today for the Sept. 4-7 event and use code BLOG100 to save $100. Chuck Hester is the chief connections officer for Chuck Hester Enterprises. As a LinkedIn trainer and speaker, helping executives and businesses get the most out of LinkedIn, while teaching them how to communicate effectively. Contact him directly at chuck@chuckhester.com. Chuck will be moderating the keynote track at Content Marketing World in September, 2018.